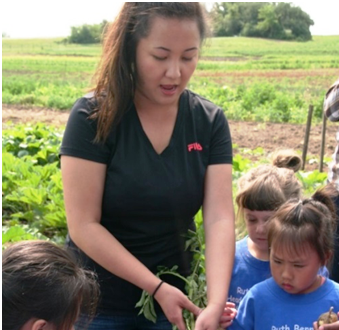 In St. Paul, Minnesota, a unique partnership—among the Institute for Agriculture and Trade Policy (IATP), the Community Action Partnership of Ramsey & Washington Counties Head Start (CAPRW), the Hmong American Farmers Association (HAFA), and the Minnesota Blue Cross Blue Shield Center for Prevention—is bringing healthy, fresh food to six Head Start centers across the city. Through the pilot, CAPRW children are introduced to a new HAFA-grown food item in their menus every two weeks. A corresponding curriculum provides classroom activities to reinforce the farm connection, such as taste testing and cooking projects, reading books about nutrition, gardening and healthy eating habits, and even visiting the 155-acre HAFA farm, just 30 minutes from St. Paul. Family engagement is a cornerstone of the project. Families are invited to field trips to HAFA’s farm, where they participate in hands-on and experiential learning with their children. Families and children harvest food and try out handmade Hmong farming tools, which allows them to see where food comes from and how it gets to their plates. The response from teachers, parents, and children has been overwhelmingly positive. In 2015, the pilot will be expanded to all CAPRW Head Start centers, and the partners will share their model with other Head Start programs in the state. Next steps for Farm to Childcare in Minnesota include building a state coalition that will coordinate efforts across the state. The ultimate goal is to bring this type of program to other Head Start and day care centers across Minnesota, giving as many children as possible access to fresh healthy foods and a meaningful relationship with their food. Realizing the significant impact of National Farm to Preschool, the Douglas County Child Development Association (DCCDA) in Lawrence, Kansas, is working to create a more sustainable and comprehensive local food system. This Farm to Preschool presentation by the CDC and Nemours is appropriate to share with your school, parents and other partners. It explains the basics of Farm to Preschool, the goals of the movement, steps to get started and resources to support your efforts.